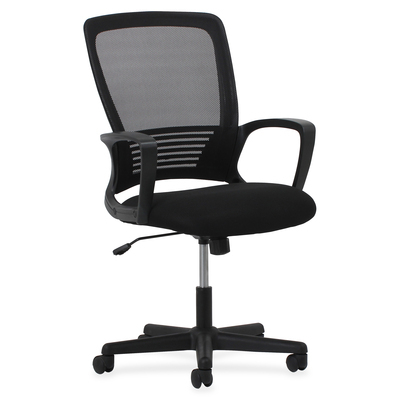 Mid-Back Chair Optimizes Comfort By Combining A Breathable Mesh Back With A Durable, Mesh Sandwich Seat. Fixed Arms Offer Upper Body Support. Back Tilts To Support A Natural Recline. Functions Include Pneumatic Seat-Height Adjustment, 360-Degree Swivel, Tilt, Tilt Tension And Tilt Lock..
Mid-Back Chair Optimizes Comfort By Combining A Breathable Mesh Back With A Durable, Mesh Sandwich Seat. Fixed Arms Offer Upper Body Support. Back Tilts To Support A Natural Recline. Functions Include Pneumatic Seat-Height Adjustment, 360-Degree Swivel, Tilt, Tilt Tension And Tilt Lock.